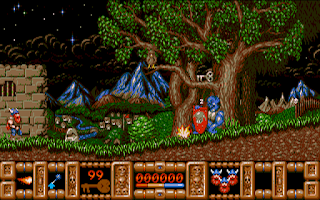 Firebird released Fire And Brimstone back in 1990 and is one of the most visually stunning platformers I have ever seen. Your adventure takes place within a fantasy world of Norse mythology as the mighty Thor whom must battle with the forces of Hel. She has escaped and spread her lust for evil over the once peaceful Nordic lands with her minions creating much havoc so it's up us to clean up this hellish infestation and get home in time for tea. Thor has four multi-screen worlds to explore, with each being a puzzle in itself which requires careful thought before you attempt to foolishly plunder through. Even the first screen can confuse some with its solution making little sense, but this style of trickery is a constant, and one you will soon get used to. Don't forget to search for objects to collect because no level can be completed unless you have found all the fragments of a key. If you happen to reach the end of a level, without finding all the parts, you are punished and sent back to the beginning. Which is agonising! 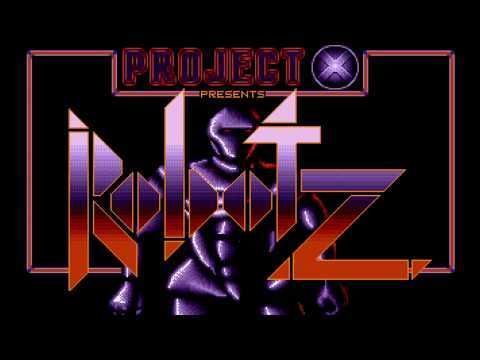 This game blows you away from the start with a superb title screen and then the game itself...!! Thor doesn't only carry an axe but two individual weapons which you can flip between and power-ups are available to collect to improve your abilities. You will need a decent weapon to battle the baddies which come in all shapes and sizes, with all possessing a cunning personality. 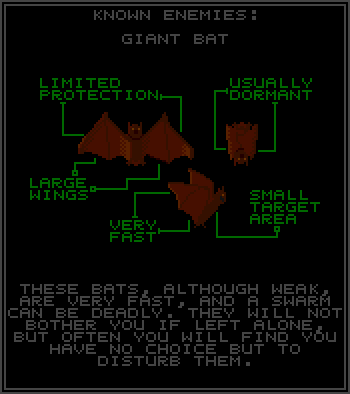 They are often difficult to kill, from a magic-throwing witch to goblins, old bats and things hiding in trees. It's impossible not to love this game's awesome charisma, and I especially love those ghosts and the creepy witches who fly by on their broomsticks. Fire And Brimstone offers an exceptional visual treat with an astounding attention to detail and an artistic flair that perfectly complements the medieval atmosphere. Characters look amazing and are superbly animated with scenic settings that are always beautiful and a jaw-dropping example of extraordinary 16-bit pixel art. Music and sound effects are great but they cannot come close to the majestic quality of the graphics. Watch out for all kinds of freaky cool monsters. Oh look, it's my mother-in-law on her broom! This is most definitely one of the most difficult games I have ever played. Gameplay will take some time to master and even then, it's still an incredibly tough adventure! Progress will always be slow and often painful but it's far from frustrating with a rewarding longevity in its design. 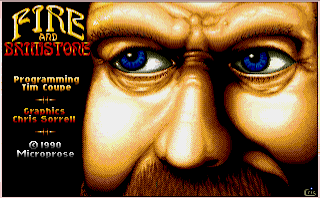 Fire And Brimstone is easily one of the best games I have ever played but I fear only the brave should enter into this world of torment. You have been warned! 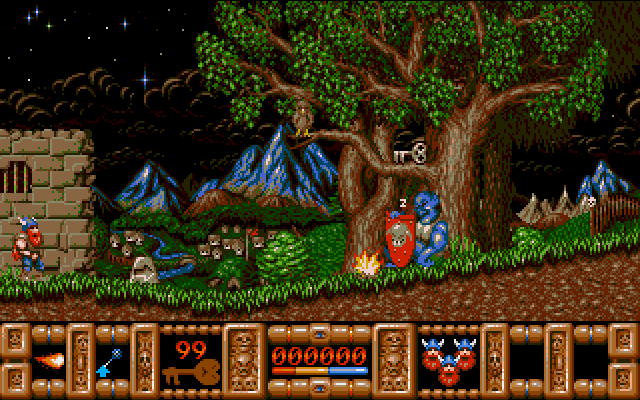 Brave warriors can play this amazing game from either the old floppy or directly from your hard drive. Teserae is a Tetris clone developed by one of the best-named groups I could have ever imagined, The Albanian Sausage Corporation!! This is pretty good and plays incredibly well with fun and progressive gameplay. However, the visuals take the theme to a whole new level with jazzy graphics, a wobbly logo, zooming backgrounds, an overscan scroller, and all at a blistering 50fps. The music is chiptune heaven and utterly gorgeous as you can hear if you play the video!! This is one of the best Tetris clones and I highly recommend you take a stab at Teserae. Following on from a previous posting, here are the remaining videos being played using a program called ST Video Player. Just like last time, these are running on a stock 8MHz Atari STe w/ a hard drive, of course. Whilst fighting for King and Country, an evil Baron has kidnapped the beautiful Princess Arthena. So jump into your chariot and rescue her. Actually, this really means playing lots of different arcade style games which surely this can't be a bad day at the local war zone, right? 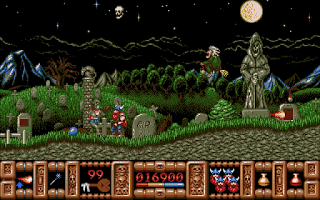 Released in 1989 by Impressions, Chariots Of Wrath isn't just one particular game but instead is a half dozen bundle of retro gaming oldies. If there was ever a mixed goody bag of various games (thrown together) then this is it. Each range in style, from a Breakout clone to a pretty nice shoot 'em up and each must be played in order before you can advance to the next. Of course, each and every game will become progressively harder the further you venture. Initially, I didn't care for the "operation wolf" clone because it's far too easy and a little boring but, later on, I admit to liking this as it became a lot harder and thus more challenging. The breakout game is pretty darn awesome and comes with a number of power-ups to increase the excitement. I found it rather enjoyable but I'm sure the Arkanoid fanboys won't be quaking in their boots! The platformer looks nice but the controls feel wooden and it has an incredibly frustrating and extremely unforgiving time limit. Asteroids also makes an appearance and plays very well with some nifty new touches that I really liked. Finally, I really enjoy the vertically scrolling shoot 'em up which is both loud and exciting. Sadly, it suffers from amateur mechanics and a little slowdown, but it is still great fun and I did enjoy it with its BOOM BOOM sound effects! 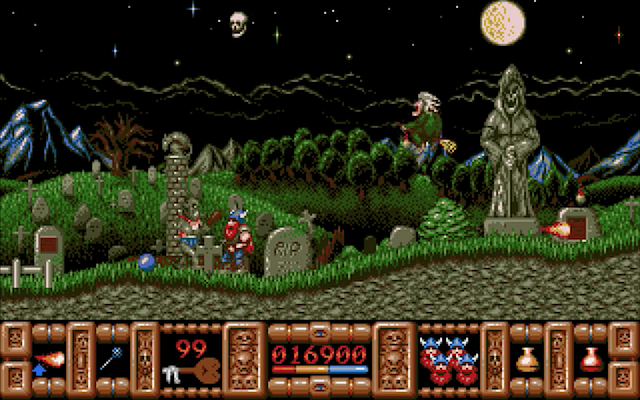 The graphics are pretty cool throughout each of the games with smooth scrolling and lots of colours, so overall my ears and eyes had little to complain about. However, in terms of playability, Chariots Of Wrath almost has an homebrew feel and, with a little spit and polish, we could have had a unique release? 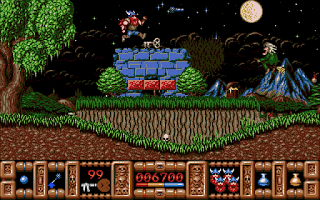 The potential is certainly there with this jack of all trades but I fear it sadly falls short and there are better games for the Atari ST.
- The best version is usually by 8BitChip and this game is no different! - For those which require a floppy disk version look no further than Old Games Finder. - Check out the superb video recording by CaptainD from Indie Game News. 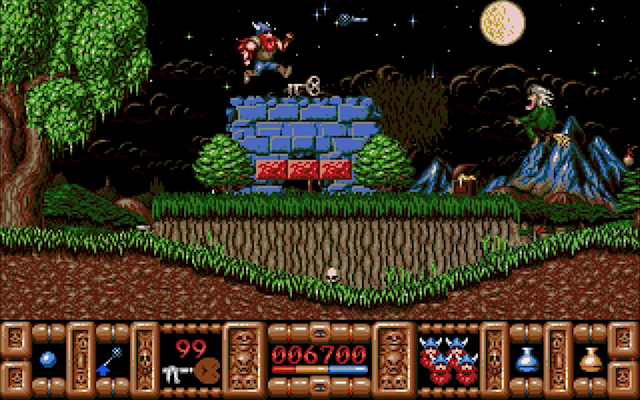 Destruction Imminent was released in 1996 by Cunning & Devious Games for the Atari ST/e and is a first-person shooter, similar to a typical Wolfenstein clone. The atmosphere is quite creepy with each area infested with a variety of strange creatures - but not to worry because there are many weapons ranging from the humble pistol to the more powerful machine gun, rocket launcher and plasma rifle. 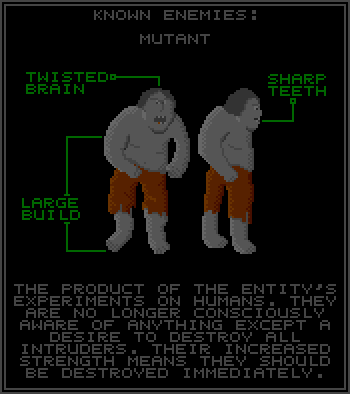 The monsters are a spooky bunch of oddballs and one is just incredibly weird looking like something from a nightmare (like a crude Daroou from Dungeon Master). It's worth watching the intro which is informative and features really stereo cool music too. Controls are simple: the cursor keys are used for movement and walking, CTRL key fires the weapon and SHIFT allows you to run away like a cowardly chicken. 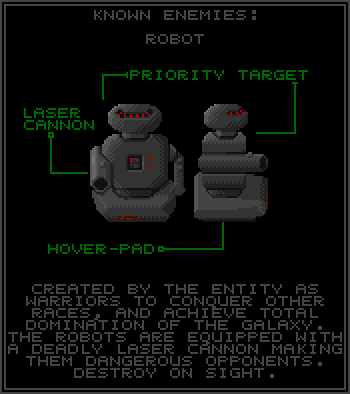 Also, side-stepping is supported and the function keys are used to flip between weapons and health. Movement is responsive and, considering it's keyboard, I'm so impressed by just how fast and smooth a stock Atari ST/e computer performs. Ignoring the drab user-interface, the 3D engine is mightily impressive with texture mapping, light-sourced sprites, and a smooth framerate. Power without the price! 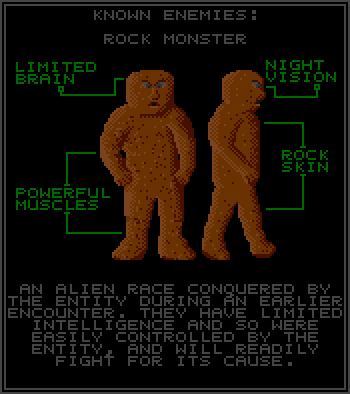 The intro informs us about the monsters we're likely to encounter and they are a freaky bunch! 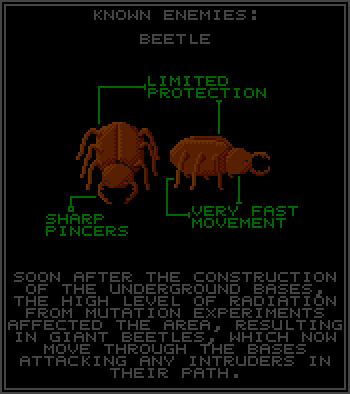 Destruction Imminent is an extraordinary example of what the Atari ST/e is capable of knocking out and it's obvious that a lot of love went into the development. It's great on the ST but everything is better on the STe with better/faster visuals along with DMA stereo music and sound effects. Stop reading and start downloading this great FPS. Tiger Road was released in 1989 by US Gold but I've always felt it didn't really do justice to the awesome arcade original. From the very beginning, you're thrown into an instant hack & slash action scenes battling a constant hoard of stupid bad guys so pick up your axe and thrash your way to victory! Well, that's easier said than done because the enemies don't ever give you a moments peace and the larger baddies are a pain in the rear end - it's so difficult to kill these guys and is made worse by little visual feedback to help show if you're doing it right. It looks pretty nice but didn't really come across very well and sometimes felt like a different game. I know the Atari ST is capable of far better. Having said all this, Tiger Road does have its moments and is a pretty fun beat 'em up. It's good but I feel that far more could have been done with this conversion. There are better on the Atari ST.
ST Video Player is one of those programs that will drop your mouth wide-open with amazement. You just won't believe that your humble 512kb 8Mhz Atari STE (with a hard drive) can produce such amazing high-colour movies. 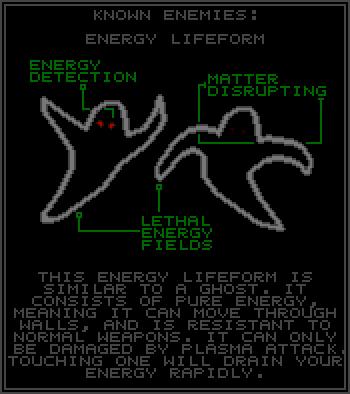 This piece of magic was written by Cyg of BlaBla (the creators of some of the best Atari ST/e demos that I've ever seen). Movies come in the format of .CAV files so just drag & drop one onto the program and prepare to be amazed. I hope to see more videos released for the Atari STe - very soon! Download from Demozoo and Pouet. 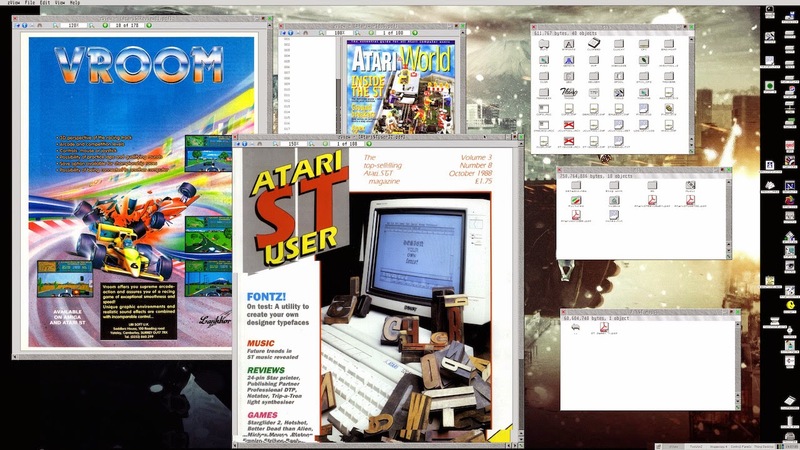 The Atari ST had some of the best magazines the world has ever seen and I still find it helpful to referring back to old issues for their features, reviews, and other information. Thankfully, there are many websites that have scans of this golden era covering ST Action, ST Format, Atari World, ST User, etc... So enjoy the read and cover disks!! AtariMania is always a great resource and they also have a fantastic magazine section. Here is a wonderful website dedicated to Atari ST Review, including their ace coverdisks. Kiwis World seems has bucket loads of Atari ST magazines. Exxos has a page for ST Format and Atari World with cover disks. The Zogging Hell website has a great collection of various magazine coverdisks.